Golf in Ireland — the Best! 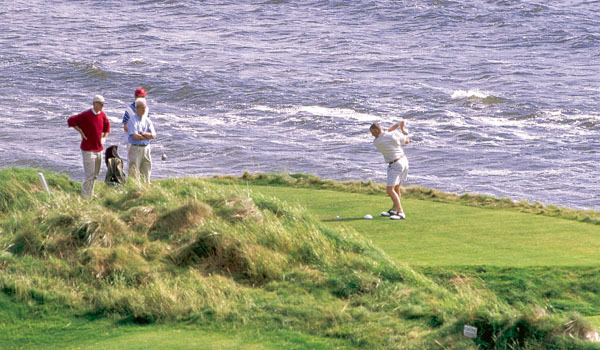 Ireland is one of the world’s premier golf destinations. With over 400 golf courses, you can travel anywhere in Ireland and rest assured that you are close to a golf course with a terrific reputation. Pretty wonderful! Of the world’s twelve top-ranked courses, three are found in Ireland: Ballybunion, Royal Portrush, and Royal County Down. Considering that we’re a fairly small island, this is truly an amazing place for golfers. You will find that Ireland’s hospitality and good cheer spill over into her clubhouses. Any level of golfer is welcome, and the courses are exceptionally well-kept. You can follow one of our suggested itineraries or create one of your own. Regardless, Authentic Ireland can help you create an itinerary that works—-and plays—-for you!